Take creative expertise to the next level with classes in Finance, Marketing + Leadership. 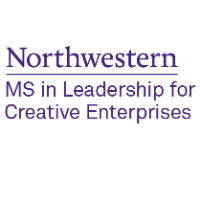 The MSLCE program at Northwestern University develops innovative and entrepreneurial business leaders across Entertainment, Media and the Arts. Our one-year cohort program fosters direct engagement with thought leaders shaping today’s creative sectors in Chicago, New York, Los Angeles and other major cultural hubs. The MS in Leadership for Creative Enterprises (MSLCE) prioritizes innovative and connective professional development, providing entrepreneurial thinkers with the tools to understand and shape their future in the creative industries. Bring new ideas to your field, solve problems and lead high-performing teams.